Have your children grown up from the time you had your swimming pool installed? Did you buy a home with an existing swimming pool and now you want to add your own unique flair? You can add fun pool water features to the swimming pool that can elevate it from ho hum to FUN! If entertaining around the swimming pool, hosting parties, simply relaxing or anything and everything in between takes place in your backyard and in your swimming pool adding water features might be the next step to elevate the backyard pool experience! Some of the features and accessories you add to your pool will elevate it from “backyard” pool to “resort” pool! Whether you have a complete outdoor kitchen area or an intimate deck and poolside seating space, when you elevate the add ons and accessories to your pool you elevate the entire space! 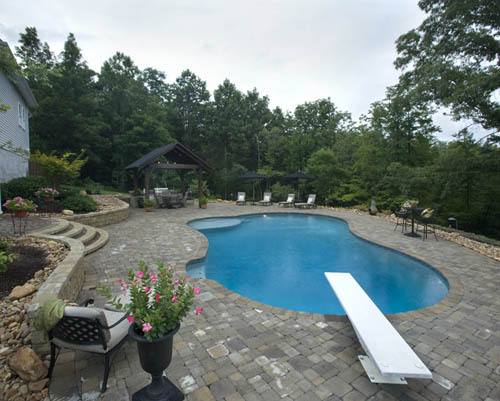 Here are some water features to talk with your pool contractor from Tipton Pools in Knoxville, Tennessee about during a pre-construction conversation or a remodeling project. Diving board. This fun accessory will require your pool be a specific depth and width to meet health and safety requirements. Ask us. Waterslides. A waterslide gives your pool the feeling of being at a waterpark. Depending on the size of your yard and the size of the pool, you can choose a waterslide to suit the space. Fountains. A fountain — either spouting off from the sides of the pool or even from the middle of the pool offers an additional way to keep cool in the pool and also add to the aesthetic of the pool. Hot tub or spa. If you want to be able to spend time in the water even when the pool has been closed for the season, you can go big, and have a hot tub or spa added to one end of the pool. A splash pad. This is an interactive water playground that would be constructed poolside for the youngsters to play in and splash through if they don’t want to be in the pool. Give us a call or talk with us when we are performing swimming pool service tasks and let’s take a look at your pool, the space and what you want to add to your pool to amp up the fun!